“MAN DOWN” finale! The Trinity and Warlord have discovered Deimos’ plan to use the Skartaran Time Weapon to reduce his enemies to dust—but time itself is not on our heroes’ side! It’s up to Superman, Wonder Woman and Batman to save Steve Trevor, defeat Deimos and seal the breach with Skartaris before the entire world is consumed by magic powerful enough to melt millennia! Trinity is coming to and while the book has been a mess, it deserved a better sendoff than this weak story. After an uninteresting trip to Skartaris, the Trinity are now is a search for Steve Trevor...kind of. 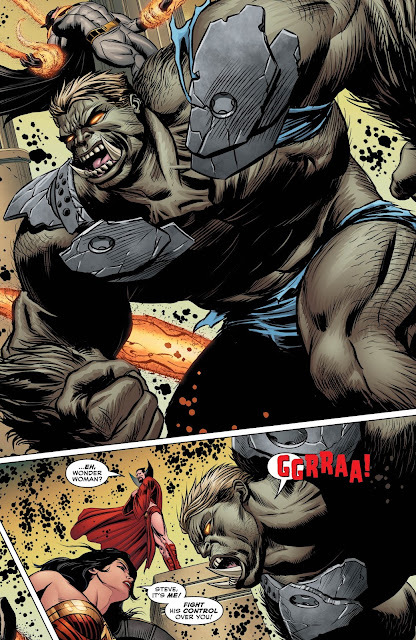 They found him last issue, but he was all monstered up so that obviously doesn't count! No matter how you cut it, it hasn't been fun, engaging or good. We open the issue with a flashback of Deimos making his deal with the Blue Strike Security and among the weapons for weapons deal that really seems a bit like revisionist history, we also get Steve Trevor mentioned to tie things together a bit. Back in the present, the battle that ended last issue rages on and we get an odd Batman narration and a metaphorical explanation of why Deimos is working with Blue Strike. Why waste your breath, Deimos? You pretty much tell them the real deal right afterward! James Robinson then tries to tie in the loose ends a bit...Warlord, the aging spell, the dead Blue Strike members, but the answers don't make this story any less boring and believe me, it is BORING! 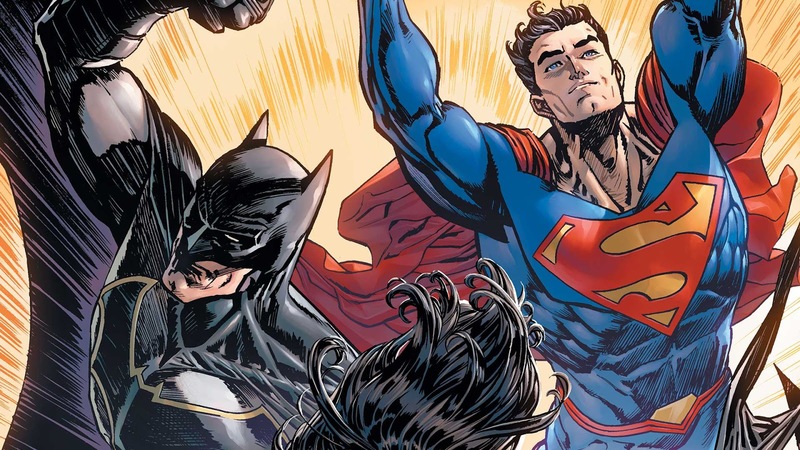 How can you have a story with the three best characters in all of comics (in my humble opinion) and make it so tedious? 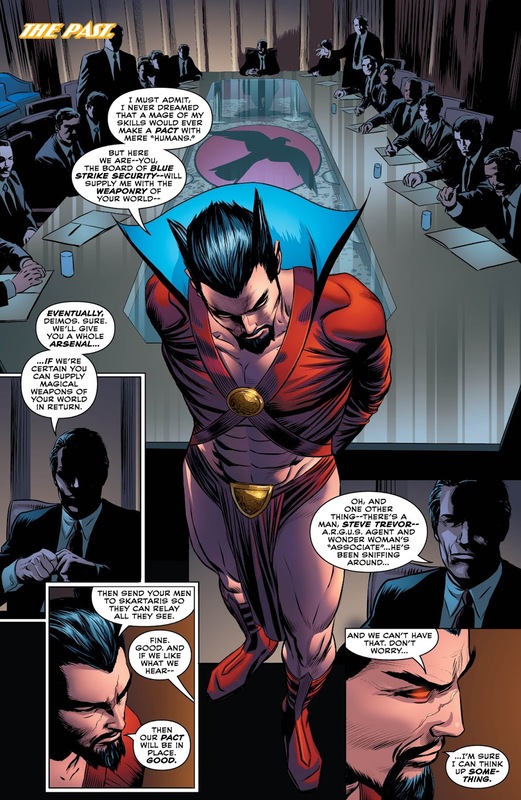 I guess Deimos slips up while monologuing (Batman says so at least), the power of love frees Steve of the magical grip on him, and we get a twist ending that does in Deimos with his own game. Batman explains what happened, but by now, I just wanted to get the hell out of this issue and series. 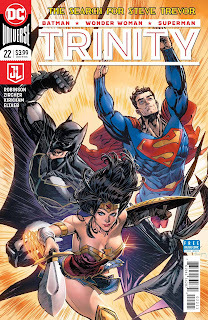 The issue does end with some legal mumbo jumbo and the Trinity in a victory pose. It's a shame that the Trinity had to go out this way. This issue and James Robinson's time on this book felt like an afterthought, but that kind of matches what this book ended up being anyway. The art is okay here, but even that felt uninspired at points. I can make excuses that Superman Reborn took away the concept this book started with, but it never adjusted and it had plenty of time to do so. 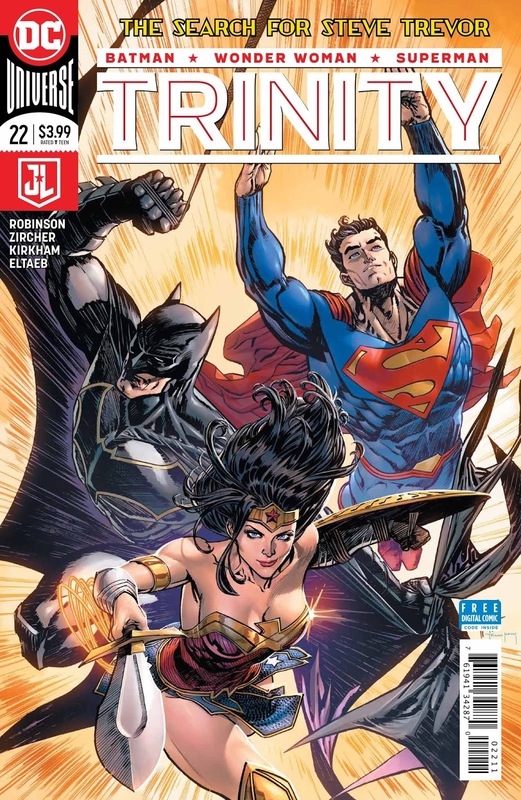 I can only hope that someone could make a book with Batman, Superman and Wonder Woman work and hopefully we will get it someday. This wasn't that book and it's a shame. Another swing and a miss in a series full of them. This issue and entire last two arcs felt uninspired which is a sin considering it's a book with DC's best and brightest characters. Oh well, the Trinity is over and I don't think too many people will be upset with that.